^ 1.0 1.1 Neil Weste, David Harris. CMOS VLSI Design: A Circuits and Systems Perspective (4th Edition). Addison-Wesley. ISBN 978-0321547743. ^ 2.0 2.1 施敏. 半导体器件物理与工艺（第二版）. 苏州: 苏州大学出版社. ISBN 978-7-81090-015-7. ^ 3.0 3.1 3.2 沈理. SOC/ASIC设计、验证和测试方法学. 广州: 中山大学出版社. ISBN 7-306-02682-8. ^ 朱正涌，张海洋，朱元红. 半导体集成电路（第2版）. 北京: 清华大学出版社. ISBN 978-7-302-18512-3. ^ 5.0 5.1 Andrew B. Kahng, Igor L. Markov, Jens Lienig, Jin Hu. VLSI Physical Design: From Graph Partitioning to Timing Closure. Springer. ISBN 978-90-481-9590-9. ^ Erik Erunvand. 数字VLSI芯片设计：使用Cadence和Synopsis CAD工具. 北京: 电子工业出版社. ISBN 978-7-121-09607-5. ^ 邓元庆、关宇、贾鹏、石会. 数字设计基础与应用. 北京: 清华大学出版社. ISBN 978-7-302-21406-9. ^ 8.0 8.1 8.2 Samir Palnitkar. Verilog HDL: A Guilde to Digital Design and Synthesis. 北京: 电子工业出版社. : 10. ISBN 7-121-00468-2. ^ 9.0 9.1 Stephen Brown, Zvonko Vranesic. Fundamentals of Digital Logic with Verilog Design. McGraw-Hill Education. ISBN 0-07-283878-7. ^ 10.0 10.1 10.2 Michael John, Sebastian Smith. 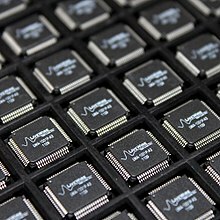 专用集成电路（英文名：Application Specific Integrated Circuits）. 北京: 电子工业出版社. ISBN 978-7-121-04036-8. ^ 11.0 11.1 11.2 David Money Harris, Sarah L. Harris. 数字设计和计算机体系结构（英文名：Digital Design and Computer Architechture）. 北京: 机械工业出版社. ISBN 978-7-111-25459-1. ^ The Life of SPICE (PDF). Designers Guide. [2013-04-04]. ^ 13.0 13.1 13.2 虞希清. 专用集成电路设计实用教程. 浙江大学出版社. ISBN 978-7-308-05113-2. ^ 14.0 14.1 14.2 14.3 Himanshu Bhatnagar. 高级AISC芯片综合：使用Synopsis Design Complier、Physical Complier和PrimeTime. 北京: 清华大学出版社. ISBN 978-7-302-14881-4. ^ 袁媛，谢巍，刘明业. 基于高级综合的RTL综合对象及方法的研究. 北京理工大学学报. 2001, 21 (1). ^ 杨宗凯，黄建，杜旭. 数字专用集成电路的设计与验证. 电子工业出版社. : 125-138. ISBN 7-121-00378-3. ^ 克里斯·斯皮尔. SystemVerilog验证：测试平台编写指南（原书第二版）. 北京: 科学出版社. ISBN 978-7-03-025306-4. ^ Laung-Terng Wang, Cheng-Wen Wu and Xiaoqing Wen. VLSI Test Principles and Architectures: Design for Testability. Morgan Kaufmann. ISBN 978-0123705976. ^ 19.0 19.1 Michael Keating, Pierre Breacaud. 片上系统——可重用设计方法学（第二版）（英文名：Reuse Methodology Manual for System-on-a-Chip Designs, Third Edition）. 北京: 电子工业出版社. ISBN 7-5053-9338-3. ^ About Design Automation Conference (DAC). Design Automation Conference. [2013-06-08]. （原始内容存档于2013-06-14）. ^ 池雅庆. ASIC芯片设计从实践到提高. 北京: 中国电力出版社. ISBN 978-7-5083-5378-4.